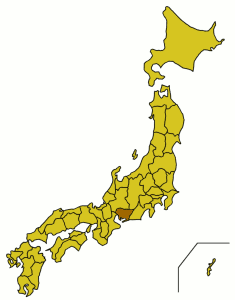 Aichi (愛知) is a prefecture in the Chubu region of Japan and was the host of Expo 2005. Nagoya - Japan's fourth-largest city. The capital and economic hub of Aichi Prefecture. Ichinomiya - a textile manufacturing town to the North of Nagoya. Hosts one of Japan's 3 major Tanabata festivals. Okazaki - A suburban town with a small castle. Seto - A center of ceramic art. The new Chubu Centrair International Airport (NGO), just south of Nagoya, is the main international gateway. The Tokaido Shinkansen passes through Toyohashi and Nagoya on its way from Tokyo to Kyoto and Osaka. Using train for transportation is common in Aichi. Major railroad is　名古屋鉄道 "Nagoya Tetsudou"(or called "Meitetsu" for short),JR東海 "JR Tokai"(Japan Railroad), and 愛知環状鉄道　"Aichi Kannjyo Tetsudou"(or "Aikan" for short). It depends on where you are going to decide which train you want to take, but JR Tokai takes you mostly to every major cities. If you want to go to more local places in Aichi, you may want to take Meitetsu or Aikan(especially for Toyota districts). Also there is an under ground subway if you want to travel local parts in Nagoya. ・the Port of Nagoya Public Aquarium This big aquarium consists of two buildings, the North and the South. The dolphin show is very exciting. There is also an orca, however the tank is not nearly large enough for a whale of this size. ・Inuyama Castle in Inuyama is a very nice castle. ・Meiji Mura, also in Inuyama, makes for a fun day trip from Nagoya. ・Higashiyama Zoo and Botanical Gardens TEL: 052-782-2111 FAX: 052-782-2140 3-70, Higashiyama-motomachi, Chikusa-ku, Nagoya 464-0804 It is a one of the zoo that published koalas for the first time in Japan. On the first through fourth Sunday of every month, you can feed some animals. In the botanical gardens, more than 7,000 kinds of plants are exhibited. You can move between the zoo and the botanical gardens by sky view train. Aichi is famous for its "miso(味噌) culture". Miso is one of Japan's traditional seasonings. (Usually Japanese eat miso as "miso soup". Of course people in Aichi eat miso soup, too.) People spread sweetened miso paste on fried pork, fried shrimp (it’s not tempura), tofu and so on. Other Aichi specialities worth a try are: Tebasaki - grilled chicken wings with a sweet, mildly spicy glaze and white sesame seeds. Eaten with the fingers, they are a popular and delicious izakaya delicacy. Tenmusu - a local variety of onigiri, filled with prawn tenpura and a fruity brown sauce. Kishimen - flat, ribbonlike wheat noodles, usually served cold with a dipping sauce, but sometimes hot in broth. Aka-miso soup - Red miso soup rather than the standard white miso you get everywhere else in Japan. Miso katsu - Fried pork cutlet (tonkatsu), but is topped with a miso based sauce. Melon Soda is a popular drink in summer. This page was last edited on 7 February 2019, at 08:52.